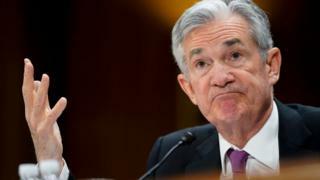 The US Federal Reserve does not expect to raise interest rates for the rest of 2019 amid slower economic growth. After a two-day meeting, monetary policymakers voted unanimously to keep the US interest rate range between 2.25%-2.5%. Fed members changed their outlook for 2019 from the two increases predicted in December to no movement. The central bank warned that “growth of economic activity has slowed from its solid rate in the fourth quarter”. Joe Manimbo, senior market analyst at Western Union Business Solutions, said: “The Fed did a big about-face on policy. The Nasdaq turned positive, up 0.35% at 7,750.7 points, while the Dow Jones Industrial Average and the S&P 500 trimmed earlier falls. Analysis of the so-called “dot plot – where members of the Fed’s Federal Open Market Committee indicate where they expect interest rates to move to – also revealed that they anticipate only one increase in 2020. Mr Powell said that there was a positive outlook for the rest of the year, with the unemployment rate under 4% and inflation below the central bank’s 2% target. But he said that “we are also very mindful of what the risks are”, which include slower global growth and no resolution on either Brexit or US-China trade talks. The Fed also said that is will slow the monthly reduction of US Treasury bonds it holds from $30bn to $15bn from May onwards ending in September. During the financial crisis, the Fed spent heavily to help kick-start the US economy. It has been reducing its a $4.2trn portfolio of US Treasury bonds and mortgage-backed securities since 2017.